Please Note: If you are looking for a Colorado Springs I-9 notary to notarize your form, Form I 9 does not require notarization and there is no procedure described for notarization in the USCIS Form I-9 Employer Handbook M-274. 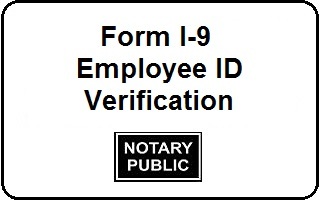 A notary may not sign the Form I-9 or other form and then notarize his/her own signature on the same document. A notary stamp or seal may only be applied when a lawful notarial act is performed, not as evidence of notary status. A notary acts as a public official on behalf of the state government, not as your private agent. For Form I-9 verification, you may designate someone to act as your agent or authorized representative. A person who is a notary is often used because they are considered trustworthy and are familiar with checking identification, not because notarization is needed. USCIS.gov instructions: When acting as an authorized representative for the employer, to perform ID verification, the notary does not attach a notary seal to Form I-9, nor use the title of notary public. Warning 1: If you attempt to pay, deceive, influence or threaten a notary to commit or assist in an unlawful act, you may face felony charges of attempting to bribe (CRS 18-8-302) or influence (CRS 18-8-306) a public official. Warning 2: If you create or require additional forms, documents, procedures, or notary seal or stamp requirements that are not required or authorized by USCIS, without a law license, you may be charged with Unauthorized Practice of Law (UPL). Only a licensed attorney may create legal documents. Warning 3: If you commit an overt act in an attempt to aid, promote, facilitate, plan, scheme, encourage, pressure or influence a notary to engage in official misconduct (CRS 24-21-531), a crime in violation of notary laws, or other laws, you may be charged with criminal attempt (CRS 18-2-101), or criminal conspiracy (CRS 18-2-201), even if the attempt is not completed or successful. Attempting to persuade a person to commit a felony is criminal solicitation (CRS 18-2-301). If you learn or know, or if the notary warns you that a requested act is in violation of notary law, or other laws, or thwarts the plan, stop your unlawful acts. Contact an attorney for legal advice. Your forms, documents, instructions, notices, email, text messages, phone calls and conversations requesting or admitting an unauthorized or unlawful act and disregarding the law or warning may be used as evidence against you. An Agent has no duty to follow instructions that are unlawful, unethical, immoral, or unreasonable, or create a risk to health or safety. We have passed the Department of Homeland Security (DHS) training and exam. For new employees, we recommend that you run a free Self Check to check your current employment eligibility status before you complete Form I-9. Once you complete the Self Check, then contact us to set an appointment to complete your Form I-9. For Form I-9 verification, you will need to present original documents, not copies, for verification of your identity and employment authorization. (A certified copy of a birth certificate is allowed.) If your documents have been lost, stolen or damaged, you should apply to get replacement documents and keep your receipt. The receipt must be issued by the originating agency or authority, indicating that a replacement document has been requested. Your receipt may be used as temporary proof of employment eligibility, in lieu of original documents. The employee must present a replacement document, or another acceptable document, within 90 days. For more information on the “receipt rule” see the example of receipt rule and the “Special rules for receipts” in Title 8, Section 274A.2 (b)(1)(vi)(A), in the Code of Federal Regulations at www.law.cornell.edu/cfr/text/8/274a.2. New employees must complete Form I-9, Section 1, by the first day of work for pay. The employer or authorized representative must complete Section 2, within 3 business days of the first day of work for pay. For example, if you start a new job on Monday, then Section 2 must be completed by Thursday. We may decline or require written employer approval to proceed if you have missed any deadline. A signed, dated note, explaining the reason for the delay, should be attached. See Penalties for Form I-9 Violations. View PDF poster in English or Spanish. View Form I-9 Slide Presentation. Effective August 10, 2016, Colorado employers no longer need to complete and maintain the Colorado Affirmation of Legal Work Status, per CRS 8-2-122. Signed into law on June 8, 2016, House Bill 16-1114 repeals the state statutory provisions that duplicated much of the employment verification requirements of the federal Form I-9. Call Jerry or send email for help with Form I-9, Self Check or other employment ID verification.